Do you think your children are too old to play with PlayDoh toys? Definitely they are not. There are many different types of Play-Doh compound now and one of them are Play Doh Plus made by especially for kids who like to play more decorating on it. 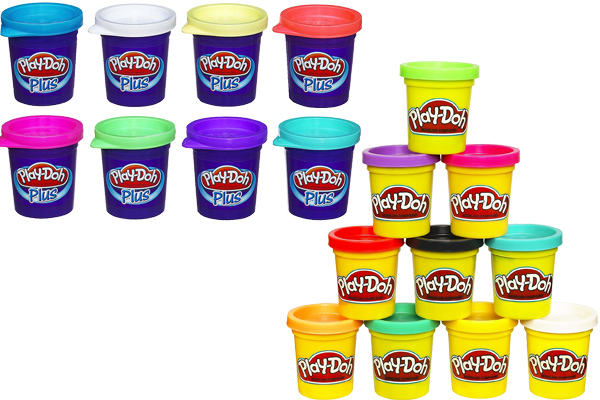 So, what is Play-Doh Plus vs Play Doh, and how is it different than those familiar, yellow containers of Play-Doh modeling compound kids are used to? We will have the further discussion on the following below. Play Doh Plus comes with a lot of fun accessories which can provide endless options for creative play such as 4 Cake cutter shapes to stamp out different cookies and cakes, 4 Frosting Tips, a turnable to turn the cake at the Frosting Station, a display dome for the budding chefs to display their frosted cakes and treats, and a set of plate, knife, fork, and a serving knife. There are also two small and uniques jar of Play Doh Plus. This compound is really smooth in texture which is suitable for adding dallops of frosting and detailed decorations on cakes, cookies, and also cupcakes. Play Doh Plus is also a slightly air and sticky texture that your children can easily extrude pushed through a tube, then use it for decorating too. It is packaged with a small and blue cans. It is an affordable toy too which many kids can afford it with their allowance money. It can make a fun addition to a birthday gift and other celebration too because, Play Doh Plus becomes a great mess-free activity and perfect toy for entertaining groups of kids at sleepover birthday parties, holiday events or even group activities like Girl Scout gathering. Play Doh is a molding toy for kids comes in form of series of toys that spark their imagination offering specific sets. They are also including an ice cream truck that can allow to make ice creams, ice lollies, and a little ice cream van. There are also cones, ice cream moulds, and a driver. Kids will really love about mixing colors, decorating, designing and using their imagination to create their own themed worlds and towns. Play Doh sometimes can be combined with another toys such as small action figures. It is not as expensive as in your minds, but Play Doh regular is just ideal for younger children to enter their world of creativity, for older, it will be so much frustating in creating and designing with more attention to detail. Many of them love to squish it, squeeze it and even mold it into letters because there are a lot of fun Play Doh tools that they use to decorate with them. Moreover, you can use this as a gift for your kids in their birthday or when they achieved something that can make you proud of them. - Includes 8 one-ounce cans of play-doh plus compound. If there is a question about whether there is a difference between Play Doh Plus vs Play Doh, the answer will be yes there is. Play Doh Plus is newer than the original one. It is also much softer and stickier than regular play Doh. Play Doh plus can be used mostly for decorating play-Doh cakes, play Doh cookie, play-Doh food items, and others shape. But it’s not as strong as you think and it’s too sticky to really mold or model much with it too. For example, you will not make a play Doh animal with play-Doh plus vice versa.